We are offering Tube Cleaning Brush. 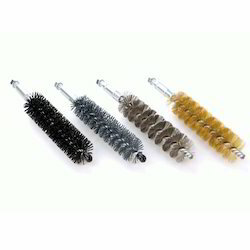 We are engaged in manufacturing and supplying a wide range of Tube Cleaning Brush, this brush is also known as the spiral or bottle brush and extensively used in various industrial sectors such as bottle brushes, condenser brushes, copper tube fitting brushes and so on. Offered range is fabricated using the finest quality raw material at our well-equipped production unit. To meet various requirements of clients, we also offer this brush in numerous specifications. Clients can avail Tube Cleaning Brush from us at market leading price.